This entry was posted on Friday, June 26th, 2009 at 6:37 am	and is filed under Gluten-Free Recipes, Seasonal Foods. You can follow any responses to this entry through the RSS 2.0 feed. You can leave a response, or trackback from your own site. Oh my goodness! I grilled these last weekend and they are so GOOD! I had no idea what these were. Hope we get more next week! Yes, I love these little curly-cues. You’d love the pesto. I’m thinking it would be wonderful on a thick GF bread topped with chopped tomatoes. Any ideas for bread? Maybe the Whole Foods GF pizza crust — that’s an artisan type bread. Try it over the Tinkyada organic brown rice pasta. Then add in some chopped tomatoes. The garlic scape pesto is almost like basil to me, it goes perfect with tomatoes. Yes, these garlic scapes are wonderful and a bit quirky. But seriously, they’ll be gone in an instant, so use them quickly. I’ll look for them tomorrow at the market. Pesto is so good. I love pesto on grilled chicken! The pesto with almonds sounds nice, too. Thanks for that link. The season is almost over — garlic scapes come and go so quickly, but they’re really a treat. Pine nuts are ridiculously expensive, so they almonds might be the way to go. Having said that, I love it with pine nuts. And yes, Dorie Greenspan is one of my favorites. We bought some scapes the other week at the market but they were the un-curly kind. I looked online and found several pesto recipes but got lazy and we ended up grilling them rubbed in olive oil- so caramely and delicious! I do love pesto though so I’m thinking we better pick up some more while they are here. Have a good weekend Melissa! You and Tevis are on the same page with grilling the garlic scapes. I’ll have to try that. I usually sauté them or make pesto. This is something I’ve never seen in the UK. I’m a big fan of pesto and this recipe sounds delicious. That does it, we’ve got to try GF pasta making to suit a fine pesto like this. I shall investigate what’s available here by way of suitable flour and report back. We made the pesto last night and it was incredible. We had it on slices of crusty french bread, and couldn’t get enough of it. We love pine nuts, and since they can be a bit pricey, we buy them in a large bag at Costco – much cheaper that way. This is an outrage! Why has everyone eaten garlic scapes except me? I’ve certainly not seen them at my local grocery store, so I feel another burdock root-esque, obsessive compulsive internet hunt is on the cards. Do GFF deliver as far as Glasgow? Melissa I’m back to ask the expert (that’s you) what to do with a few of the MANY goodies we picked up at the farmers market this morning. Some delicious beets (inspired by your recent recipes!) and some beautiful carrots. I’m not so worried about the actual veggies but their greens… any ideas or recipes of what to do with these? Carrots tops as a salad just don’t do it for me. Maybe even a recipe to combine them together? Also how do you feel about eating carrots/beets un-peeled? Weird or good for you? My opinion is a little dirt never hurt ya and more of the nutrients are there un-peeled. 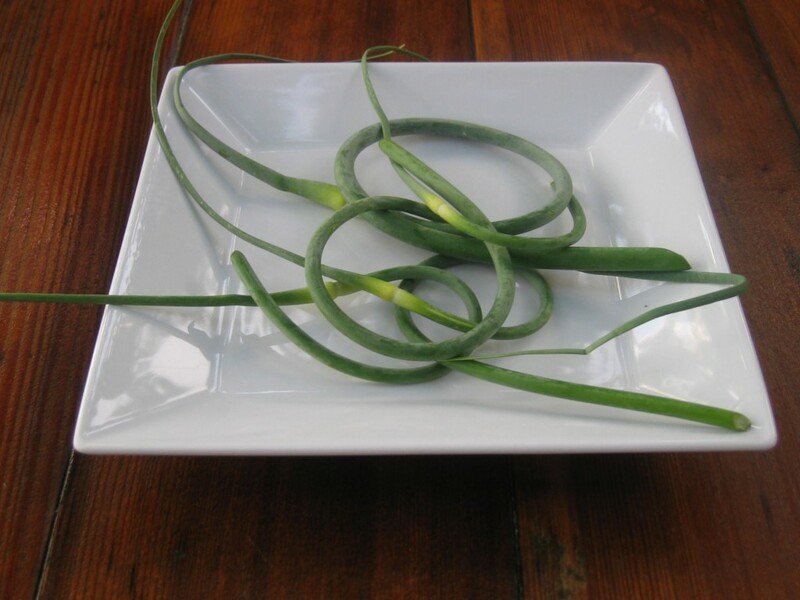 You would love garlic scapes, especially making a pesto using your exotic cheeses. Not to mention your hand-crafted pastas. We get these early in the growing season and they are such a treat. Unfortunately, they are gone before you know it! Welcome! Oh, the crusty French bread sounds delightful, but I must pass on that one. There are some good alternatives, but not as easy to make. Such is life. Thanks for the tip about pine nuts at Cosco. Interesting! Yes, the are definitely pricey. Whole Foods (Whole Paycheck) has them for $26 a pound. YIKES! Thanks for leaving a comment. I appreciate it. It appears Cid hasn’t had garlic scapes either. You have garlic in the UK, so you must have garlic scapes. See if Miles can grow you some. I’m going to ask Andy Grant if he’s interested in branching out, but I don’t know if his “eat local” campaign would sound all that sincere if he delivered to Scotland! What is available to you at Farmer’s Markets? Your comments always crack me up. You’re a funny guy, GDave. I never peel beets or carrots unless there’s a really funky section. I have a veggie scrubber and I really work them over, making sure they are clean. Here’s a post I did on beet greens and I comment on the peeling part. I use a potato peeler and often just peel raw carrots or beets into my salads or right into the saute pan. I don’t see any reason to peel beets as the skin keeps the red juicy stuff from getting all over. Plus, there has to be some good nutrients in the peels. Just a personal preference, I guess. And you know, I love sauteed beet greens. They are a favorite of mine. As for the carrot greens, I find them bitter, but some people do use them. They’re nutritious and full of chlorophyll. You’ll notice that’s something that health food stores are pushing now. Chlorophyll is thought to help reduce the growth of cancer cells. I don’t know as I haven’t looked into the science behind it. I throw my carrot tops in my compost pile, but always a bit reluctantly because they look so wonderful. You can juice them with something sweet (apple, the carrot, etc.) — I’ve done that and they’re okay. I’m just not crazy about the way they taste. Let me know if you discover a wonderful new coconut and carrot green recipe!! You know beets and carrots are the sweetest veggies. That’s probably why they’re favorites of mine. Yum, veggie candy. Not sure if you’ve tried this, but we combined two of your recent posts for breakfast yesterday – the garlic scape pesto and the poached eggs with kale. Added a thin layer of pesto to a slice of bread, topped with sauteed kale, then added a poached egg. Fantastic!!! No, I haven’t tried that and thanks for commenting on it. Wow, that does sound delicious. Good idea! I’m really liking the garlic scape pesto and am going to make a basil walnut one and a cilantro version as well. It’s such a good thing to use in so many ways — as you’ve discovered with the kale and eggs. Can’t wait to try it. I need more garlic scapes!! I love them. and it rubs the peels right off it’s so harsh. Maybe you have something less abrasive? To think we haven’t even found a burdock yet (lord knows I’m still trying!) and now we find out we’re lacking in scapes. There’s nothing for it but to grow our own and know just when to tackle the scapes before they bloom presumably? I stick them in minestrone and butter sauces for fish dishes, they’re great aren’t they? Yes, let me know if you figure out a good (and tasty) use for the carrot tops. Oh, that’s too bad about your CSA choices so far. I’m so lucky to have this great resource nearby! I’ve never seen that scrubber you have, but it does look interesting. I have the oxo version. It’s the first one listed on the Amazon.com page. (Google vegetable scrubbers Amazon — the link is too long to insert here.) I stick mine in the dishwasher regularly just to keep it clean. Although your comment wasn’t directed to me, I’m going to chime in anyway. You must be my long lost cousin as I just finished (almost, must proofread now) a post in which I actually said “I make things up.” And that was before reading your comment to GDave. You know me all too well for not knowing me. Wow, good idea. Thanks! You’re inspiring me to try a salmon mix with the scapes. I also thought I might mix them into a Tuscan type soup with kale. I have an abundance of kale right now. Wow this was great! I put in the leftovers from the night before in my bake potato. It was delicious. Yum!! I have gotten garlic Scapes in my CSA share, too, & also usually saute them in a bit of coconut oil with onions & such. Pesto … nummy! I have made some lovely pesto with nettle tops (some of our OG farmers have them available throughout the season) just lightly cook & use like you would basil – you could use the quinoa greens that way, too! Thanks for the comment. Nettle tops is a new one for me. I haven’t used them yet, but your recommendation is enough to motivate me to find some! Love your contributions! You’re a girl after my own heart!